J. Larry Tyler is Chairman and CEO of Practical Governance Group, a team of healthcare consultants and academicians passionate about good governance and the education of healthcare boards. The group’s activities include conducting board presentations, board retreats, board self-evaluations, and board and CEO succession planning; facilitating; and writing comprehensively on governance issues. Errol Biggs, PhD, FACHE, Vice Chair at Practical Governance Group and head of the Healthcare Administration program at the University of Colorado Denver, and Larry co-authored Practical Governance. Published by Health Administration Press, it offers useful advice on topics that matter most to healthcare boards – from structure to strategic planning. Larry has spoken on governance for numerous hospital associations and health systems. Since 1983, he has served as faculty at the American College of Healthcare Executives’ Congress on Healthcare Leadership. Among his seminars are “CEO Governance Roundtable,” “Governance Forum: Taking the leap toward exceptional and courageous board governance and leadership” and the governance portion of ACHE’s immersion course. Larry is an adjunct professor in health administration of the University of Colorado Denver and the University of Alabama at Birmingham. Originally from Washington, a small, historic town in eastern Georgia, Larry began his professional career on the audit staff of Price Waterhouse & Co. and became a Certified Public Accountant in 1975. Three years later, he founded Tyler & Company, which conducts executive-level searches for the healthcare industry. In 2008, Larry was named by BusinessWeek as “one of the top 100 most influential headhunters in the world.” He shares his knowledge and nearly 40 years of experience as a healthcare executive recruitment consultant in the pages of Tyler’s Guide: The Healthcare Executive’s Job Search (fourth edition), which takes readers from beginning to end of the job-change process. Throughout his career, Larry has had the pleasure of partnering with healthcare organizations and leading search assignments resulting in thousands of successfully placed healthcare executives. Of these, more than 185 were health system or hospital CEOs across the United States. Today, Larry is Chairman Emeritus of Tyler & Company, which in 2013, became part of Jackson Healthcare. Larry is a Fellow of the American Association of Healthcare Consultants, where he served as Chair of the Board from 1994 to 1995. In 1989, he was named recipient of the association’s Chet Minkalis Service Award. In 1995, he was cited by his peers as one of the top search consultants in the United States in the book, The New Career Makers, by John Sibbald. Larry is a Fellow of the American College of Healthcare Executives (ACHE), where he served as a Chair of the Career Development Committee from 1994 to 1996 and two years on the Editorial Board of ache.org. Larry has served consecutively since 1983 as faculty at ACHE’s annual Congress on Healthcare Leadership. In 1997, he received ACHE’s Regent Award for Georgia. In 2010, he received ACHE’s President’s Award for his “tireless contribution to ACHE’s career advancement efforts.” Larry received in 2012 ACHE’s Exemplary Service Award, the association’s highest service award, for his commitment of volunteer service to the healthcare management profession. And in 2014, he was elected to serve for three years on the Council of Regents, ACHE’s legislative body. Larry also is a Fellow of the Healthcare Financial Management Association (HFMA), where he served on the Editorial Advisory Board of its journal, Healthcare Financial Management. 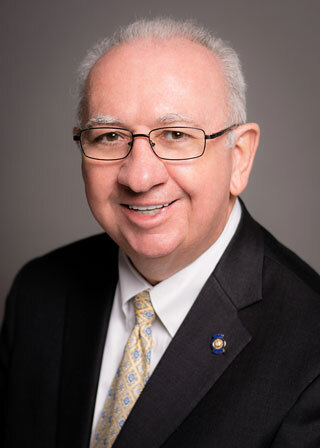 He is a recipient of three of HFMA’s awards for personal participation (Follmer, Reeves and Muncie). He is a Certified Medical Practice Executive of the American College of Medical Practice Executives, and he is a member of the American Institute of CPAs and the Georgia Society of CPAs. Larry earned a Bachelor of Science in Industrial Management from Georgia Institute of Technology in Atlanta and a Master of Professional Accountancy from Georgia State University in Atlanta.